Retirement Confidence Down: Even though the stock market has rallied by more than 50% from its recession-era bottom in March 2009, Americans have continued to lose confidence in their ability to afford retirement. 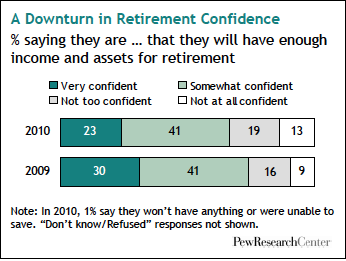 Some 32% of adults now say they are “not too” or “not at all” confident they will have sufficient income and assets for retirement, up from 25% who said the same in February 2009. This uncertainty is greater among younger and middle-aged adults than among older adults. It is also greater among adults with low incomes. Retirement Delayed: Among adults ages 62 and older who are still working, 35% say they’ve already delayed retirement because of the recession. 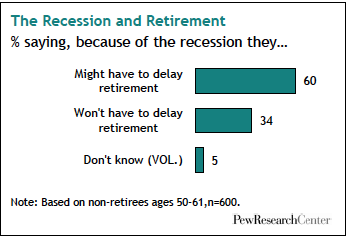 Among adults ages 50 to 61 who are currently employed, six-in-ten say they may have to delay retirement because of the recession. Raiding the Cookie Jar: Four-in-ten adults (41%) who have a checking, savings or retirement account say that during the recession they have had to withdraw money from their savings account, 401(k) account or some other retirement account to pay their bills. Younger and middle-aged adults report having done this at higher rates than those ages 65 and older. Lower-income adults have done it at higher rates than have upper-income adults.